Published: Nov. 29, 2017 at 03:19 p.m. Updated: Nov. 29, 2017 at 03:29 p.m. So you think you're perfect, eh? Well, don't just talk about it. Be about it. Prove to your friends and (more importantly) strangers you'll never meet that you're a fantasy football genius. Every week, set the perfect fantasy lineup for your chance to win one million dollars. You could use a million dollars, right? Right. 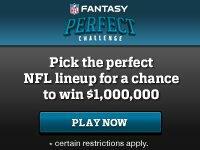 Haven't joined NFL Perfect Challenge yet? Don't worry, you can get started in just a few seconds RIGHT HERE. Below are the Perfect Challenge picks for Week 13 from The NFL Fantasy Stronghold. Case Keenum and Adam Thielen have been straight fire over the past few weeks and the Falcons don't look like the team to cool them off. Marshawn Lynch has slowly been looking like the Beast Mode we've known in the past and faces a Giants team in disarray. Samaje Perine is now the back of record in the District of Columbia. Keenan Allen is looking to build off two monstrous fantasy games against the Browns. It's after Thanksgiving so Zach Ertz can really take off now. The Chargers defense gets to tee off on a woeful Cleveland offense. And Wil Lutz. Gelhar is staying on the Russell Wilson train, for good reason. Even against a tough Eagles defense. Jordan Howard is a pretty easy call against the 49ers defense. Le'Veon Bell is good at football and should get weekly consideration. DeAndre Hopkins is still a beast, which is bad news for the Titans secondary. A.J. Green against the Steelers is a matter of trusting your player's talent. Jared Cook is a sneaky good play because ... Giants. The Jaguars defense is always a safe selection. And Justin Tucker. Harmon has no fear of rolling the Wentz Wagon into Seattle for a primetime showdown. Hi, Jordan Howard. Is this the week that Leonard Fournette gets back on track against the Colts? I don't have to explain why someone would choose to start Antonio Brown. Davante Adams has been the one Packers receiver to trust with Brett Hundley at quarterback. Zach Ertz is still here! The Jaguars are hanging around. And Justin Tucker. Jared Goff is a bit of an outside-the-box play but could see some run against an uneven Cardinals secondary. 'Sup, Jordan Howard? Dion Lewis should stay hot against a bad Bills run defense. Yo DeAndre Hopkins, what's good? The idea of a red-hot Robby Anderson against a bad Chiefs secondary seems too good for me to ignore. This could finally be the big breakout week for Hunter Henry against the Browns. The Chargers are still at the party. And Greg Zuerlein. Those are our picks for Week 13. Hit us up on Twitter with your lineup. Enjoy the games! Marcas Grant is a fantasy editor for NFL.com. Follow him on Twitter @MarcasG, Facebook, Instagram and Snapchat at marcasg9.